"Peanut Blossoms made with sweetened condensed milk." In large bowl, beat condensed milk and peanut butter until smooth. Add baking mix and vanilla; mix well. Shape into 1 inch balls. Roll in granulated sugar. Place 2 inch apart on ungreased cookie sheet. Bake 6 to 7 minutes. Place chocolate on cookie and place back in oven for 1 to 1 1/2 minutes. This came out great! Quick and easy! I wasn't sure what "mix" to use, I had some bisquick and some Jiffy, and used one cup of each. Turned out great! My kids really like them, but I'm a bit disappointed. I followed the directions exactly. They were very easy though. 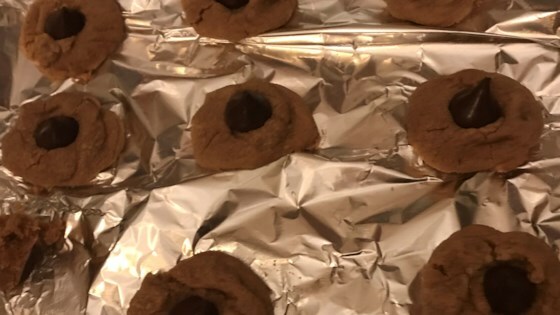 This recipe makes the absolute best Peanut Butter Cookies an it is the easiest by far - no need to try any other recipe. These are excellent cookies and turn out moist and chewy. Very rich though!